For sale at Oxford University Press. “Mahdi al-Herati is sipping his lemon tea in the open-air café beneath the grand Italian porticos of Algiers Square in Tripoli. He seems a little too casual to be either an international jihadi or the elected mayor of the capital city of a country supposedly rescued from Colonel Muammar Qaddafi and sliding into civil war. Still, Herati is both, although he prefers to call himself a Libyan revolutionary. Since becoming mayor last year, he tells me, he has invited his counterparts in Dublin and Rome to “twin” with Tripoli under its new rulers, the group called Libya Dawn. He has taken other steps to counter Libya Dawn’s reputation for Islamism. He speaks of his efforts to drum up support from local writers and actors for an arts festival he has planned promoting Tripoli as a cosmopolitan Mediterranean capital of culture. Herati plans to reopen the movie houses that Qaddafi closed in an earlier revolution. His men protect the national museum, he says, which is crammed full of ancient pagan statues. A new spa for women is opening. And yes, he tells me, his festival will include female as well as male performers and spectators. The capital, he says with only an occasional look over his shoulder and at his two security guards, is safe. The Libya Dawn coalition Herati belongs to overran the capital after six weeks of bombardment last summer. Many of its leaders are former militiamen from the Libyan Islamic Fighting Group, the jihadi movement that after fighting the unbelievers in alliance with Osama bin Laden in Afghanistan turned their guns on Qaddafi and his army. But allied with them are such unlikely bedfellows as merchants from Misrata, a Mediterranean port dependent on trade with Europe, and the Imazighen, or Berber revivalists, whose leaders are either secularists or adherents of a small reformist sect, Ibadiyya, dating back to the first decades of Islam, that opposed the supremacy of the Prophet Muhammad’s Arabian tribe and elected its own leaders. As in the time of Qaddafi, words and reality in postrevolutionary Libya often seem to inhabit separate spheres. Twenty minutes before landing in Tripoli, women returning from Egypt drape their highlighted hair and designer jeans in black cloth. The women at passport control have gone, and the man in charge of immigration is the one with the bushiest beard. Inside the city, Muslim iconoclasts are purging the capital of its colonial-era images. Soon after capturing the capital in August, they fired a shell through the belly of the Bride of the Sea, a sculpture of a bare-breasted mermaid entwined with a tender gazelle, which since Italian times had served as a backdrop for wedding photos. And last month they stole the sculpture itself. Herati only got it back because the thieves could be traced by the cameras Qaddafi hid in the capital’s roadside trees. For now, though, he says, it is safer for it to remain under wraps. Other monuments in the capital are disappearing too. The three tombs of Ottoman mystics that graced the entrance of the eighteenth-century Ahmed Pasha Qaramanli mosque at the entrance of the souk have been smashed, and replaced with an already overgrown patch of grass. Islamists have snapped off the antique Koranic inscriptions in the souk’s other old mosques, lest believers be led astray into polytheism by venerating the ornaments instead of God alone. Libya Dawn’s officials blame the attacks on the local followers of a Saudi scholar, Rabi’ al-Mudkhali. He works, says an official, with Saudi intelligence, seeking to tarnish the name of Islamist groups that do not follow Saudi’s puritanical doctrines or more importantly their politics. Others suggest that acolytes of Caliph Abu Bakr al-Baghdadi’s Islamic State, or ISIS, are finding a foothold thanks to Libya Dawn’s relaxed approach to Islamic extremists. I failed to find evidence of the Islamic State cadres that had been reported in Tripoli, but cafés frequented by couples have been torched and embassies car-bombed. A couple of days after I left Tripoli, a gunman shot dead an unveiled woman driving home near the city center. Lest anyone be tempted to investigate, in mid-November Libya Dawn raided the National Commission for Human Rights, seized its database, and padlocked its doors. Tripoli’s distraught population might have welcomed anyone bringing a semblance of order, including the ghost of Qaddafi. But three months into its rule, Libya Dawn’s honeymoon is fading. My first night in the capital was blissfully free of explosions. Libya Dawn had sent text messages to residents’ mobile phones banning not just gunfire but fireworks. But the following night, Tripoli’s gunpowder orchestra began its familiar crescendo. The criminal gangs who had largely gone underground after Libya Dawn took over again began trying their luck. Driving back into town after a meeting in Café di Roma, a popular rendezvous in an upmarket suburb, I was caught in the crossfire after a local Islamist militia—connected with Libya Dawn—clashed with local drug barons. The young men in a neighboring open-air café went on watching televised soccer, so common were such shootings. Husbands continued their shopping, and drivers waited at traffic lights with almost exaggerated decorum. Libyans feel even more isolated than when the UN imposed sanctions on Qaddafi. The civil society that briefly emerged after the colonel’s downfall has all but disappeared. Each activist can reel off the names of colleagues shot dead or kidnapped, often by Islamists. “My husband hates guns, and vowed he would never get one,” says my friend from the Café di Roma, who is an economist. “Last week for the first time he brought one home.” Exiles who jubilantly if naively returned to build a new post-Qaddafi order have almost all left. Many more would have gone with them had Europe’s consulates not all withdrawn and with them any hope of a visa. 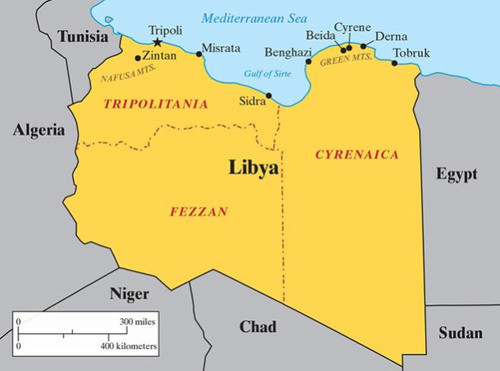 Libya’s neighbors periodically close their borders. And flights out of Libya are in jeopardy too after rival armed groups began targeting the country’s airports. Libya should be one of the world’s richer states but many facilities and power stations have been set aflame as Libya Dawn battles for control of the oil terminals along the Gulf of Sirte coast. “The Revolution’s leaders promised we would be like Dubai,” says a civil servant who doubles as a taxi driver to make ends meet. “But private hotels that had opened in the last years of Qaddafi have shut down. There’s no business. And where before we had one family who stole, now we have hundreds.” Just like Qaddafi, Libya’s rulers win power by seizing it. Although Herati himself was elected in local elections, his movement, Libya Dawn, is made up of the factions that fared badly in the June general election for Libya’s parliament, the House of Representatives, and then took Tripoli by force. After they were displaced, the winners of the election fled to Libya’s far east. A short distance shy of the border with Egypt, they seemed to be preparing for a last stand. From their seat of government in the hilltop city of Beida, ministers sit behind empty desks while a central bank governor with empty coffers signs ornate declarations for their Potemkin state. At one point, the parliamentarians took refuge in a ferry anchored off Tobruk, the coastal town nearest the border with Egypt. But by presenting their cause as a struggle for survival against jihadi Islam, they have found allies at home and abroad. They made an alliance with the remnants of the armed forces, which fought Islamists in the east under Qaddafi, and they launched a counter-attack they called Operation Karama, or Dignity. “There are two rival programs jostling for power in Libya,” Mohammed Bazaza, the young spokesman of the Dignity security forces in Beida, tells me. “The Islamic state and the civil state. If we don’t react now, [Libya’s] terrorists are going to come across the Mediterranean to a place near you.” Last year, he says, Ansar al-Sharia, the same group whose members killed the US ambassador, Christopher Stevens, on the eleventh anniversary of al-Qaeda’s attacks in America, killed his father, a security chief in Benghazi, the east’s provincial capital and birthplace of the 2011 revolution. The group planted a bomb in his car, and then for good measure set off another bomb at his funeral. Leading the Dignity counterattack is Khalifa Haftar, who as a young army officer helped Qaddafi launch his coup in 1969, and after commanding Libya’s forces in a disastrous war on Chad fled to the United States. Some twenty-five years later, he seized on the 2011 revolution as an opportunity for staging a comeback. Though himself from a relatively small Bedouin Arab tribe, he wooed larger ones to his side, and last year he commandeered what remained of Qaddafi’s army and turned to the region’s anti-Islamist powers for support. Haftar launched Dignity’s first operation in May in Benghazi, Libya’s unruly second city, where Islamist jihadis, tribesmen, and student revolutionaries all jostled for control. The results were initially meager. He dealt with snipers by shelling the apartment blocks from which they were shooting. The tactic was counterproductive, creating more opponents than it killed. But when he acquired spare parts for the army’s aging fighter jets, the battle lines began to shift. Air strikes helped him capture much of Benghazi and project his strength deep into the west of the country. He intermittently cut off Libya Dawn’s exits by bombing the land crossing to Tunis and bombing Tripoli’s airport as passengers were preparing to board planes. Piqued and irate, the head of Libya Dawn’s government in Tripoli, Omar al-Hasi, who before the war was a geography professor, rallied to the side of Haftar’s foes in the east, Ansar al-Sharia, the killers of Christopher Stevens, calling them “amiable revolutionaries.” In the lobby of the Tripoli hotel where al-Hasi has set up his Dawn government, his ministers and commanders congregate, encouraging militiamen to plant more car bombs. Indeed hundreds of miles to the east, glass litters the parking lot of the former royal palace in Beida that now serves as the seat of the constitutional assembly. Convoked by Dignity, its defiant chairman, Ali Tarhouni, says he has survived fourteen attempted assassinations. A short drive away, Dignity’s deputy prime minister looks out of his window disconcertedly at the upturned breeze blocks placed every ten yards or so beneath his office. These are security measures taken since a car bomb exploded a week before we met. “Terrorists will always find a way through,” he says glumly. At the same time, Libya Dawn’s forces have been advancing east toward their beleagured allies, besieged by Haftar’s forces in Benghazi while setting on fire the country’s main oil terminals along the Mediterranean Gulf of Sirte. Black plumes of burning oil from the country’s largest terminal at Sidra waft toward Europe over more than seventy miles. As the stakes rise, the efforts of the UN envoy, Bernardino León, to mediate a compromise repeatedly falter. According to Libya Body Count, which uses press reports to keep a tally of all deaths since January 2014, 2,500 people were killed just in the past six months of fighting. The scale of the terror and destruction on both sides far surpasses that of Qaddafi’s last years. One wonders how many of the Westerners who cheered on the war against him recognize this. It was always unrealistic to expect Libyans to emerge overnight from four decades of whimsical dictatorship into a state of democratic institutions. Western powers provided the military support to oust the colonel, but myopically not the civilian support to put a workable administration in his place. When civilians tried to erect a modern state themselves, warlords from the different parts of Libya easily bypassed the elections that had been held and seized power in the name of whatever cause they hoped might attract support. Some militia leaders justify their recourse to arms as a battle against jihadi Islamists or the remnants of the Qaddafi regime. Others claim to defend whatever tribal, religious, or ethnic group might win them local constituencies. They have tried to revive traditional myths in order to cultivate fresh loyalties. In the process a once relatively homogeneous society has splintered into multiple bickering armed groups. The irrepressible rise of Libya’s many contending forces is one of the enigmas of the 2011 revolution. When Libyans first revolted, they counted among their blessings that they had few of the cleavages of sect and ethnicity that divided other Arab states. Through intermarriage, relocation for work, and Qaddafi’s deliberate jumbling of ethnic groups, many Libyans had multiple associations spanning the country’s vast terrain. Yet The Libyan Revolution and Its Aftermath, a compilation edited by Peter Cole and Brian McQuinn, British analysts of Libya, is a timely acknowledgment that Libya’s chemistry is older than the laboratory Qaddafi fashioned. The book traces not only the colonel’s demise, as many others have done, but the appearance of a lesser-known new cast. Written almost entirely by foreign experts, some of whom know the different factions intimately, it is the most detailed account I have read of the old forces shaping new Libya. Chapter by chapter, it analyzes each of the “sub-national identities” jostling for influence, and the communal narratives their representatives use to promote their claims. They include Libya’s Islamists, the merchants of Misrata, the Arab Bedouin tribes concentrated in the Green Mountains of the east, the indigenous Imazighen (i.e., Berbers) in the west, and the two ethnic groups of Libya’s slice of the Sahara—the Tuareg and Tubu. In a hollow beneath the crest of the Green Mountains lies Cyrene, a Hellenistic city about 130 miles east of Benghazi. In ruins since the seventh century, it was once dubbed the Athens of Africa because of its many ancient philosophers. In Cyrene it is possible briefly to forget the encroaching war. Families displaced by the fighting find relief sharing a picnic amid the city’s lost grandeur. Boys dive into Apollo’s pools where Caesar once wooed Cleopatra. Lovers, with the young women sometimes fully veiled, slip into the shadows between the columns of Mithra’s temple to hold hands. And professors from the nearby highland town of Beida regale each other with Bedouin verse, a pre-Islamic tradition reviled by Islamists, while swigging home-brewed grappa, one of colonial Italy’s more enduring legacies. “I’ve tried to bandage the pain of my love, but the wound just grows deeper,” sings Salah, a lecturer on urban planning who helps Haftar’s generals draw their battle maps. On our way back to Beida, the lecturer, with alcohol-induced clarity, questions the notion that the conflict is a battle between Libya Dawn’s Islamists and Dignity’s old security apparatchiks. “No one here believes it. We have our Islamists, they have theirs. Ours were the first to officially adopt sharia law, after Qaddafi was killed.” At Beida’s Turkish restaurant, he introduces me to his friends—bank managers, delegates to Dignity’s constitutional assembly, and more university professors, who despite their disparate professions all recite proud verses about their Bedouin past. The current conflict, they insist, is primarily an epic struggle as old as Islam, between, on the one hand, Bedouin Arab nomadic tribes of the hinterland, and on the other, Libyans living on the coast. While they celebrate the troubadours and swordsmen of their Bedouin forebears, they disparage their coastal rivals who have rallied to the side of Libya Dawn. A lawyer who took up arms curses them for having been bastardized by mingling with indigenous Berbers inhabiting the west and with the waves of colonizers who have washed up on Libya’s shores, and reduced them to effete, urbanized taxpayers. Reciting from al-Sirah al-Hilaliyya, an Arab bard’s answer to the Song of Roland, they tell of the Banu Hilal and Banu Sulaym, who surged out of Arabia in the eleventh century and swept aside the bourgeoisie in Cyrenaica and beyond. The Banu Hilal Arabs settled in the east; the Banu Sulaym Arabs in the west. When Libya’s Revolution erupted in 2011, the Bedouin Arabs saw their chance for a second coming. The bank manager joined his Bedouin Arab tribesmen from the Green Mountains. With arms in the trunk of his SUV he raced toward Benghazi, while the Bedouin Arabs’ counterparts in Zintan, a Bedouin town in the Nafusa Mountains, established their hold over the capital Tripoli, eighty-five miles north on the coast. But others besides the Bedouin Arabs sought their share, too. Last July the disparate militias from the coastal cities, the Berber towns, and Islamist movements concentrated in the west joined forces, creating the coalition of Libya Dawn, and forced the Bedouin tribes to retrench. Back in Beida, Salah the urban-planning expert and his Arab kinsmen dream of reviving the dominance they enjoyed when Cyrenaica was an emirate under the king and the Arab tribes ran his army. They hope to reconstitute such a force under Haftar, and look to him to crush the revolt of non-Arab settlers on the coast below. It oversimplifies, of course, to reduce Libya’s conflict into a battle between Bedouin Arab tribes and Libyans of other ethnic groups Arabized over centuries. Some Bedouins hold senior positions in Libya Dawn, and Berbers can be found fighting for Dignity. But increasingly, the rank-and-file on both sides paint the conflict in stark ethnic colors. The Bedouin professor Salah and many like him dismiss their opponents in the east as settlers from the west brought by colonizers over the centuries to weaken the Arab tribes. The family of Wissam ben Hamid, a militia leader fighting Haftar’s Dignity forces in Benghazi, he notes derisively, comes from Misrata. Surrounded by Berber towns, the 40,000 Arabs of Zintan increasingly see themselves as a Bedouin fringe left out on a limb in the Nafusa mountains of the west. They have rapidly shed the alliance they formed with their Berber neighbors to unseat Qaddafi in the heady months of 2011, and allied themselves with the Arab Bedouin and their armed forces in the east. With the help of the United Arab Emirates, the Zintani Arabs repulsed a two-month offensive by Libya Dawn’s militias drawn from western cities ten times its size. We feel we are waging an existential battle, a young Zintani man tells me. The Berbers, he says, have never forgiven the Arabs for killing their Berber Jewish queen, Kahina, when the first generation of Muslims spilled out of Arabia in the seventh century. Berber revivalists, too, paint their struggle as a similarly ancient tug of war against 1,400 years of Arabization. They have turned to Berbers in neighboring Algeria as well as large diaspora communities in Europe to combat pan-Arabism. “While we look to the Maghreb [west North Africa], the Arabs look to the Mashreq [the Middle East],” says Wael, a Berber activist in Tripoli, who reprimands me severely when I speak of the Arab Spring. “North Africa’s spring,” he corrects me. No doubt the next time I visit Libya, the country’s constellation of alliances will have shifted again. Bedouin tribes who rose up against Qaddafi in the east might have tired of producing a new crop of colonels to rule them. The UN’s decision to blacklist Libya’s more radical Islamist movements might prompt Berbers and people from Misrata to withdraw from their alliance with Libya Dawn. Communal conflicts that seem so unsolvable when one listens to the invective on their rival satellite televisions have an odd way of melting away once dialogue starts.